Healey Library will be closed Tuesday 4 pm – Wednesday 10 am due to necessary facilities work. As always, online resources are available through UMBrella. 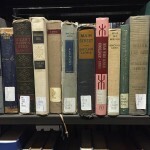 For library research questions, please email Library.Reference@umb.edu. As of May 26, 2017, Healey Library will no longer be providing access to RefWorks. For over a decade, RefWorks has been licensed by Healey Library as our primary citation management platform, but the time has come to replace it with more sophisticated, cost-free citation management tools such as Zotero and Mendeley. Please do not worry if you are currently using RefWorks for an assignment or research project that will be completed before the end of the academic year. We will continue to support and provide access to RefWorks for the remainder of the academic year, so students, faculty, staff, and alumni are certainly welcome to continue to use it up until we discontinue our subscription on May 26, 2017. If you no longer use RefWorks, your account will be deleted, and no further action is needed. Librarians already have workshops available in selecting a citation manager as well as training in both Zotero and Mendeley. These workshops are available to all faculty, staff, and students and will be offered throughout the Spring semester as well. Librarians have prepared online documentation to assist all community members in the transition from RefWorks. You will find in this link clear instructions on how to export your reference library from RefWorks into another citation manager. You will also find a comparison of different citation management programs to help you choose a new citation management platform to use. Please contact Mary Moser, Deputy Manager for Outreach, Marketing, Fundraising, and Grants at mary.moser@umb.edu or 617.287.3207 with any questions, concerns, or feedback. Thank you for your patience and your continued support of Healey Library! See our FAQ for instructions. Curious about using Apps for teaching and research? 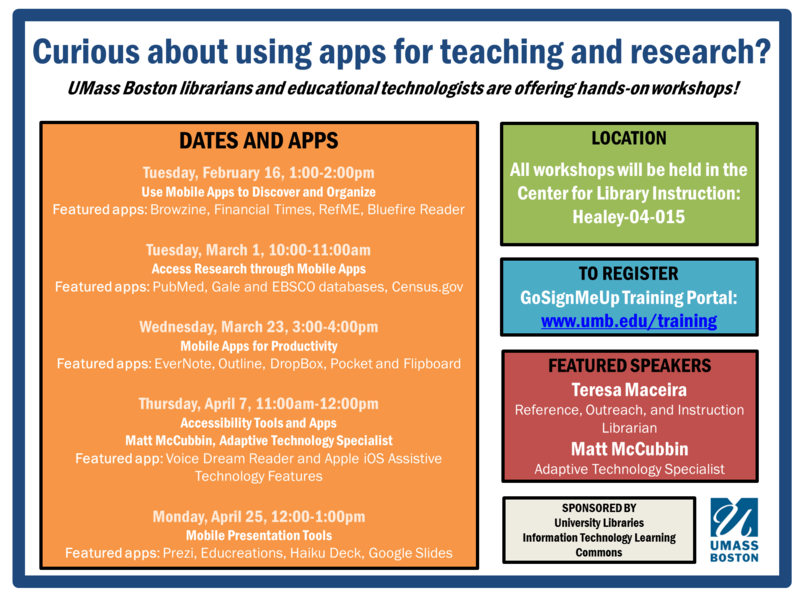 UMass Boston Librarians and Educational Technologists are offering hands-on workshops! Add mobile apps to your research tool kit. Attend 1…or all 5 iPad workshops and get hands-on experience with educational apps through engaging exercises aimed at exploring the potential of research apps. Join Librarian Teresa Maceira and Adaptive Technology Specialist Matt McCubbin in this series of sessions covering a variety of apps for searching our databases, access e-journals and e-books, discover and organize online content, create quick and easy presentations, and learn about accessibility features on Apple devices. Feel free to share this announcement with colleagues and students –the workshops are open to everyone!